♥Teaching Fabulous Firsties and 2nd Grade Smarties!♥: Cyber Monday Sale! Woo hoo! Cyber Monday Sale! Woo hoo! It has been ages since I last blogged. I had to take a self imposed blogging break because there was just too much "life "going on. I had to take a mental health break to save my sanity (or what was left of it). Can anyone relate? :-) So after doing a lot of nothing for Thanksgiving vacation, I'm back! I had an iPad funded through Donors Choose! So, I am having fun trying new things on it. I am even writing this blog post for the first time on the iPad. Woo hoo! This microphone gadget is a hoot! I like dictating my words, but I think typing is more my speed. 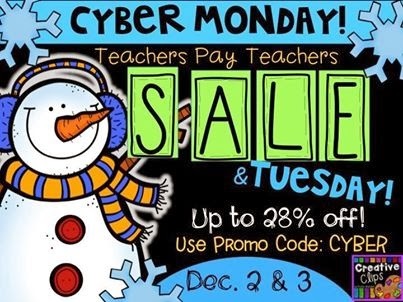 Have you been getting ready for Teachers Pay Teachers' big sale? I'm afraid I have been doing a LOT of shopping and getting my cart ready for checkout tomorrow. All of my items will be 20% off! Be sure to use the promo code: CYBER to get up to 28% off! December is so busy and it often is hard to keep my kids involved in rigorous learning! So, I created a Common Core-Aligned Winter Math and ELA print and go pack that has a fun winter theme. I love to have the kids do math centers, but sometimes you just need something fast and fun that you can whip out in a minute, right? Click on the picture to check it out on TpT! Be sure to download the preview, as it has a couple of freebies included! Earlier this year, I added "Jumping in with Number and Base Ten Second Grade Mega Pack." It has really helped my kids with the tricky Common Core State Standards! If you are looking for some more winter activities, check these out! If you would like to see some Christmas-themed activities, here you go! Happy Shopping and have a great December!